A belated Happy Birthday to our regular host, Orange! My name is Sam Donaldson, and I’m your guest blogger for today’s cavalcade of Sunday crosswords. No, I’m not the Sam Donaldson of ABC News fame; I am merely a Sam Donaldson. But to my knowledge I am the only Sam Donaldson that occasionally constructs crosswords (under the more formal moniker of Samuel A. Donaldson—a variation of “a Sam Donaldson,” I suppose). I also use the pseudonyms “Patrick Berry” and “Frank Longo,” so maybe you have seen some of my work…. But enough about me! Let's get to the puzzles! 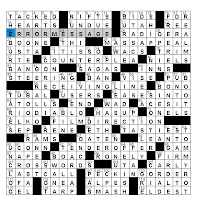 Randolph Ross's New York Times crossword, "Let's Talk About Me"
["Pardon me"] is an ERROR MESSAGE. It's a very polite way to indicate that someone may have made an error. As in, "Pardon me, but it appears you are driving off with my car." ["Save me"] is a MASS APPEAL, something a parishioner might shout during the service. ["Feed me"] is a COUNTER PLEA, what a hungry customer at a diner might say. It's also what Audrey II cries to Seymour in "Little Shop of Horrors." I think that's why this is my favorite theme/clue pairing. ["For me?"] is a possible line that a gift recipient might use, so it's a RECEIVING LINE. ["Shoot me"] is a FILM DIRECTION, one used especially by directors Quentin Tarantino and M. Night Shyamalan, as they like to pull an uber-Hitchcock and give themselves extended cameo roles in their own films. ["Make me"] would be some CROSS WORDS. So would any number of phrases that I uttered while falling into several of this puzzle's traps, as explained below. ["Kiss me"] apparently indicates a PECKING ORDER, as in "Kiss me, first, and then you can go kiss all those other people." ["It's on me"] is a FREE RESPONSE. I'm not positive about this, but I think the idea here is that if you and a friend went to a party with an open bar, you would say jokingly to the friend, "What'll you have? It's on me!" At least I would. This explains both why I get few party invitations and why, when I do, it seems I attend them alone. But perhaps I am missing something here? ["Write me"] looks to be a BOOK PROPOSAL. It is? Is the book proposing to me that I write it? Is someone asking for a really long postcard? It's moments like this is when I turn to this blog, confident that Orange will explain it for me. If you're doing the same thing now, I'm sorry to let you down. But I'm sure someone will help us out in the comments. I think some of the pairings work better than others. I like the ones where I could see the theme entry being used as a clue for the "me" phrase if the shoes were reversed. "Mass appeal?" would be a great clue for SAVE ME, for example, and "Counter plea?" would be a fun way to clue FEED ME. But I wouldn't clue MAKE ME as "Cross words?" and I wouldn't use "Pecking order?" as a clue for KISS ME. So the unevenness troubles me a little. In terms of the fill, I love the nice open corners in the NW and SE, where triple-8s meet some double-6s and a theme entry. Love [Superlative on "Top Chef"] as the clue for TASTIEST, since I have a crush on one of the hosts of that show. THE BURBS is just a fun entry, and a real treat as 1-Down. LAST CALL, NO NUKES, and BANG ON are good, lively phrases. My favorite clue, hands down, is [Word that led to the "Why a duck?" routine by the Marx brothers], the clue for VIADUCT. It reminds me of their "Dollars, Taxes" (Dallas, Texas) gag in Duck Soup that my nephews could recite from a very young age. [Seeding org.] is a fun clue for USTA, the United States Tennis Association. As a clue for WAD, [Plug] slowed me down a little. I suppose some might wince at RIO DIABLO, since it seems a little desperate to reach for a 1993 TV western. But what, 30% of all westerns contain either "Rio" of "Diablo" in the title, right? So I thought it was fair. I found ONE LS (first-year law students) a gimme, but that's because I get to teach to them starting in about a month. I started this puzzle with a brand new eraser on my trusty solving pencil, or, as I call it, The Death Wand. I think I'll soon need another eraser. I fell into every conceivable trap in this puzzle, and there were lots of them. Please tell me you fell into some of these too: (1) "encircle" for ENGIRDLE; (2) "spot on" for BANG ON; (3) "epics" for SAGAS; (4) "standing" for STEERING (hey, you can't tell me a column doesn't stand); (5) "pod" for GAM; and (6) "El Al" for BOAC (c'mon, every four-letter airline is El Al!). Between these traps and some of the names and high-falutin' stuff not within my admittedly narrow bailiwick (CORELLI, GISELLE, FARAD, and the like), I ended up with a solving time much slower than my usual Sunday. Of course this happens the one time I broadcast my solving times to the web-iverse. Normally, Merl’s puzzle is identified on this blog as the “Philadelphia Inquirer” puzzle, but I’m going with the Seattle Times instead (it’s the same puzzle). I have my reasons: (1) I live in the Seattle metro area, so this has been my traditional second Sunday puzzle for years; (2) the Seattle Times was the second paper to pick up Merl’s puzzle in syndication, so it’s senior (the Inquirer was third); and (3) this particular puzzle’s theme relates to water, and Seattle is to water as Paris is to love. SURFACE STREETS is clued as [Stoplight milieu], and every successful “schwimmer” must “schurface” after diving in the water. CASTRO’S CUBA, the [Dictatorship that turned 50 this year], has “scuba” hidden after the apostrophe. That’s a lively phrase, no? VIRGINIA WADE was the [1977 Wimbledon winner], and water mavens like to wade. SGT. SNORKEL, clued as [Beetle Bailey’s topkick], stumped me for a while. First, I don’t think I have ever seen the term “topkick” before. When I saw it in the puzzle, I thought of professional wrestling; turns out it’s military slang for a first sergeant. Second, I only know the character as “Sarge.” His canine companion, Otto, is a constructor’s crutch. Finally, I wouldn’t let myself enter the abbreviation “SGT.” in the grid because nothing in the clue was abbreviated. I have become a slave to cluing conventions! Look, if Sarge’s title in the strip is always abbreviated (that is, if his formal name is “Sgt. Snorkel” and not “Sergeant Snorkel”), then I can be convinced that there’s no need for an abbreviation in the clue. But Wikipedia lists the character as “Sergeant,” so I think there should be some signal in the clue. Granted, citing Wikipedia is like citing Grandpa—sometimes it’s just not accurate no matter how authoritative it seems. But I guess I'm still troubled. SELFISHNESS, [Generosity’s antonym], has something fishy inside. TOM CRUISE is the [“Valkyrie” star]. In the original version of this puzzle, he was clued as a “Taps” costar. For more on Tom Cruise, watch most any episode of “The Soup” on E! WASSAIL SONG is clued as [“Here We Come A-Caroling,” e.g.]. I don’t know if Merl wants us to find “sail” or “sails” as the water verb. I prefer the plural since it straddles the two words, but this would be the only plural water verb in the puzzle. So now I’m thinking it’s supposed to be just “sail.” But if that’s the case, does “wassail song” trip off your tongue as an in-the-language phrase? GEORGE RAFT is a [“Some Like it Hot” co-star] and this puzzle’s “WTF”-inducing section for me. George Raft?!? I would have wanted “backdrafts,” “draft board,” or “first draft” here, but maybe those just wouldn’t work. PROTUBERANCE is a [Bulge], and there’s a “tube” inside of it. Insert your own joke here—I’m not going there. I suppose Courtney Cox could have inspired a puzzle, too, but it might flunk the breakfast test. Some of the notable fill, from my perspective: The KISSER that is [Alice’s face?] took me way longer to figure out than it should have—I kept thinking it was some reference to Alice in Wonderland instead of Alice Kramden from “The Honeymooners.” The [Real name of Kirk Douglas] is ISSUR Danielovitch? Holy Moses (pardon the pun)! And isn’t it bizarre to see ISSUR right atop ISSUERS? TWO PHONES, the [Household minimum these days], only came after trying two-income, two people, and two person. Does this feel a little dated to you, too? Merl’s puzzles always entertain me, and this was no exception. Maybe it’s because we are both University of Arizona graduates (unlike me, however, Merl is a distinguished alumnus). Eleven theme entries surrounded by smooth fill is impressive. 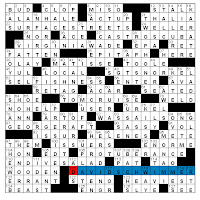 The inconsistent placement of the water verbs within theme answers (sometimes at the start, sometimes at the end, sometimes in the middle, sometimes straddling words) “dampened” my overall enthusiasm for the puzzle, but this was still a fun summertime diversion. Mike Peluso's Los Angeles Times crossword, "Injured"
DRAFT LOTTERY is a [Vietnam War program] and an event usually held at the start of a fantasy baseball season. A [Driver's warning, perhaps] is a DASH LIGHT. The only dash light that works in my car is the yellow light telling me I'm almost out of fuel. Then the game begins! How long can I go before the tank is dry? Fortunately, I've never learned the answer. A DOUBLE LIFE is [What spies often lead], and that's a great clue because my first thought was along the line of "mission." A [Place to sign] is the DOTTED LINE, even though most signature lines these days aren't dotted. DIRTY LOOK is clued with the poetic [Leer or sneer]. If [It's no longer spoken anywhere], it's a DEAD LANGUAGE. To [Be slain by a stand-up comic?] is to DIE LAUGHING, my favorite theme entry. It's always interesting to me when one of the theme entries uses a clue involving wordplay and none of the others do. This doesn't bother me in the least, but I wonder if others (a) noticed it, and (b) were bugged by it. And an Arthur [Murray offering] is a DANCE LESSON. By the time I reached this part of the grid, I had the theme, so I wrote "deadpan look," convinced the clue was talking about Bill Murray. This is my day for springing traps! Thank goodness I was wrong--deadpan look would have been a rotten entry. This puzzle was smooth sailing for me--anytime I can get a 21x21 grid solved in under 20 minutes it means my hangups were few and far between. Just about the only problem area for me was the WNW, where ["Le Roi d'Ys" composer] Edouard LALO meets POILU, the [WWI French soldier] (I wonder if they get along?). Total guess for me there. I see Lalo also meets O'NEAL, the [Ryan of TV's "Peyton Place"] who happens to be under scrutiny recently for coming clean about accidentally hitting on his daughter, Tatum, at Farrah Fawcett's funeral. Wow. Quick, back to the puzzle. I enjoyed the solve, as there was much to like. Of course I liked SAFECO, the Seattle [Mariners' park, familiarly]. Even more familiarly, we call it "The Safe." Less familiarly, it's Safeco Field, a great venue for baseball. The M's are playing one of the Axis of Evil (aka, The Yankees) this weekend, so the excitement level there has reached a *cough* fever pitch. THE BAR looks like an awkward phrase, but the clue ([Words after pass and raise]) makes it seem quite legit to me, and I love that the clue tries to make me think of poker first. Didn't know that "aardvark" was DUTCH, but it makes complete sense. Odd to have both SSRS and SSTS in the same grid; I wish Mike could have worked in SSNS for the trifecta. [Getting unauthorized R&R?] was a fun clue for the old standby AWOL. Just one clue I still don't get, so I would appreciate any guidance in the comments: why is SPECTRE clued as [The ghost of Mrs. Muir?]? I think I get the wordplay of the movie title in the clue, but I don't understand the connection to the answer. Does it somehow relate to James Bond? Ah, nothing like a Klahn themeless puzzle for dessert. All of the pleasure and none of the guilt! I'll go further with the metaphor (which will now become a simile): a Klahn themeless is like a rich, rich chocolate mousse. I love it, but I usually have to take it home with me to finish--it's just too complex and overwhleming to have in one sitting. Fortunately, Bob kept things rather light and refreshing here. This 70-worder has lots of goodies, like these: OPEN A CAN OF WORMS, clued as [Create new problems], spans the equator; [One whose words cannot hurt you] is just a terrific, unforced clue for NAME CALLER; COPERNICAN is a fun entry, but the clue, [Of a revolutionary theory about revolutions], really makes it shine; and then you have POTEMKIN VILLAGE, an [Imposing, diversionary facade]. That's a term I have heard, but I never knew its meaning or origin. Apparently, this Potemkin dude wanted to impress the boss, Catherine the Great, when she toured Crimea, a region that Potemkin's forces had just captured. So he ordered the construction of hollow facades along the riversides Catherine would travel so it would look to her like the region was a great prize. Basically, Potemkin was the forerunner to Michael Scott. (That's a reference to "The Office.") Modernly, then, a Potemkin village is any intent to divert attention through an elaborate ruse. Hey, look, it's Sarge's (er, Sgt. Snorkel's) dog, OTTO, camped right up at 1-Down! He was my first entry into the grid, and the extreme NW fell rather quickly. Took a while to get the last word of ON THE MAP, as it I wrestled for the longest time with MAFIAS, clued as [Iniquitous cliques]. "Iniquitous" would make a very Klahn-ian grid entry, wouldn't it? I slowed down from there, as the [Preeminent Jewish philosopher of medieval times], Moses MAIMONIDES, was completely foreign to me. Moved to the NE and confidently wrote in "frosty" for FRAPPE, the [New England milkshake]. My parents must be proud. But when 12-Down, the [Volunteer group created in 1961], had to be PEACE CORPS, I saw my error. Headed to the SE, where Woody BOYD [Harrelson on "Cheers"] was a gimme. BOYD fed GARGOYLE, the [Grotesque medieval spout], and before long that corner was complete. Once I passed Ptolemy and Galileo and landed on Copernicus, the SW soon fell. The Missing in Action Boston Globe Crossword. It appears that the Cox & Rathvon Boston Globe puzzle is down for the count. As of very late Saturday night it still was not accessible through the Puzzle Pointers link. If it's posted when I wake up tomorrow (remember, I'm on the west coast), I'll add it to the mix. But if not, then my work here is done. Before I hand the conch back to Orange, I want to thank her and her cadre of regular bloggers for all of the fine work they perform on this site. As a solver, the Diary is an invaluable resource when I don’t get the theme or can’t figure out what letter is supposed to go in that last #&*%-ing square. It also reassures me sometimes that, yes, the puzzle was unusually hard. For someone learning the ropes of construction, it offers insight into what crossword connoisseurs like and dislike. I distinctly remember reading a review of another puzzle in which Orange praised some wide-open corners in a mid-week NYT puzzle. I challenged myself to try the same on a grid I was working on at the time. That puzzle went on to become my NYT debut, and, sure enough, Orange’s review mentioned the triple-stacked 9s in the corners (with approval, thank goodness). So this blog has been (and continues to be) a tremendous asset for me, both as a solver and constructor. I know many of you feel the same way, and I know others have said nice things before (more articulately, too). But some things are well worth repeating: this site rocks!